The Deep Roots Music Festival is excited to introduce Montreal-based Cajun/Zydeco band Grouyan Gombo at this year’s Cajun Heat evening. They will be a treat for all who love Cajun-Acadian music and they are sure to have us shaking on the dance floor. Grouyan Gombo presents a savory gumbo of southern and northern traditions. Their sound constitutes a unique blend of Cajun, folk and Creole tunes, grooves and songs, including lots of originals. The group’s members, who hail from Quebec, Acadian and Maritime parts, were drawn together by their intense experiences listening to and playing Cajun and Creole prairie music down south. 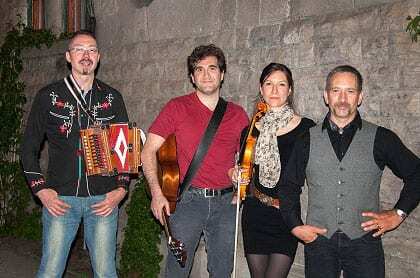 For their performances at Deep Roots, they will be a four-piece band composed of Bernadette Fortin: fiddle, Harlan Johnson: accordion and vocals, Shawn Pitre: guitar and vocals, with Marcel Weaver on the upright bass. Grouyan Gombo will be part of a licensed late-night dance party, ‘Cajun Heat,’ at the Old Orchard Inn Barn, Friday Sept. 27th, that also includes Unisson, David Greely, and Georgette LeBlanc as emcee.